Today’s blog is all about creating your own signature system and why it’s so important for your business. It may seem like a hassle to have to fit what you do into an easy to remember framework, especially if you’re reverse-engineering it…ie, you already have your process and now you have to try to shape it into a step by step model. But, I think it’s worth the effort. About a year and a half ago, I wrote a book called ‘How to be a DIVA at Public Speaking’. D.I.V.A. is an acronym. “D” stands for Dynamic, being lively and interactive. “I” stands for being an Inspiring speaker, which is in part about telling stories to touch your audience. “V” is about being a Valuable speaker; whenever you speak you want to leave the audience with some lasting value. And “A” is for being Authentic, being yourself. 1 – It shows you mean business. It’s very customer-focused to have an acronym or a framework because it is easier for your customer to understand and get a grasp on what you do. 2 – It shows that your thoughts are organised. If you have a system, and you’re speaking about it to a group, it’s so much easier to find your place if something happens in the middle of your speaking opportunity. Clients will think that you are organised in all aspects of your business, and they’ll feel more at ease. 3 – It gives your client a road map for working with you. They can clearly see what you offer and can therefore articulate exactly what it is they need from you and what they don’t. They know exactly what’s coming, session by session, step by step. Also, some clients prefer to plan every step of the way. They can see the way you lay out your content and they can easily interpret that and envision how your product or service will meet their needs. 4 – Final (bonus) reason! It gives you more options when you’re training, teaching, or speaking. You can talk about the overview of your entire system or model. Or, you can choose to go deep into just a couple of areas or elaborate fully on a single point, depending on how much time you have. This can create more desire to work with you. If your prospects get great value from just the two or three points you share with them, then how much more will they learn from you if they buy into the entire system or programme???? It’ll make them hungry for more. Check out my signature system here: https://sholakaye.com/get-clients-with-speaking/ It’s quite a simple one. I teach you to become a D.I.V.A. and then a S.T.A.R! You could go much more complex with yours if it fits your business. And if you’re struggling to come up with ideas, why not book a half day VIP session with me so I can get to know your business and help you craft something catchy. So put your thinking cap on and create a signature system that brings together what you do in an easy to understand way. You’ll be doing both yourself and your clients a favour! 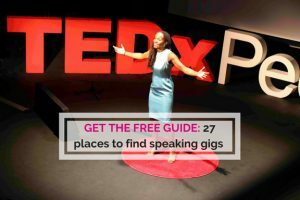 Get my freebie – 27 places to find speaking opportunities. 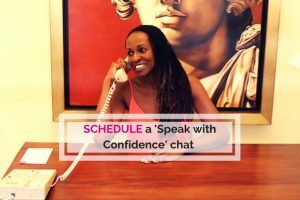 Join my Facebook Group – Public Speaking for Female Coaches and Entrepreneurs. 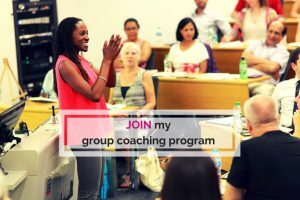 Join my group coaching program – Get Clients with Speaking in 60 Days. Find out about my VIP Days and private coaching.